If you’re a fan of road trips in the United States, you’ve probably heard of the famous highway 101 road trip. It’s a road that follows up and down the west coast line of the United States. It crosses over Washington, Oregon and California and includes some of the most amazing views in the country. If you were to look up the word “beautiful” in the dictionary, the highway 101 road trip would be listed as an example. Before I made my big jump to live in Vietnam, I decided to drive this highway as a farewell trip. I’m so glad I did, because it turned into the trip of a lifetime. I decided to make the most of what I had for the trip. My Subaru Crosstrek became my home for the three days, as I decided to car camp instead of staying in hotels. This offered me several benefits. I was able to save money on accommodation. And I was able to go at my own pace. I didn’t need to rush to make it to the hotel in time, or slow down if I was running ahead of schedule. Where I arrived each night, I had a place to sleep. Read my previous post on how I turned my Subaru into a camper vehicle for almost no money. I lived in Seattle at the time., so my road trip entailed the pavement between Seattle and San Francisco. I chose San Francisco as my final destination because I had some friends living there that I wanted to spend some time with before my move. My plan was set, I would drive down to San Francisco taking my time. I set aside three days and two nights to get there. My drive home back to Seattle would be a straight shot over two days and one night up I-5 to save time. My car was packed with clothes, food, and sleeping supplies and I was ready to go. This is a really popular destination for locals in the area. Cannon Beach is home to many popular films like the Goonies and Twilight. You can read more in a previous blog post about Oregon. I’ve been there a few times before, so I didn’t spend too much time here. But if it’s someone’s first visit, I’d recommend spending a night or a few hours to explore. Neighboring Cannon Beach is Seaside, which is also a great spot to visit. Devil’s Churn had a very picturesque view of the Pacific Ocean. There’s a little walk you can take to see different views of the churn, and it’s a really cool spot. At this point in my trip, it was starting to get dark. This was about the time I hit the Sea Lion Caves. It includes America’s largest sea cave, and is a really cool experience. As an animal lover, this is a really fun place as it’s covered in sea lions, birds, and other sea creatures. You do need a ticket to enter, so be prepared to pay a fee. It was about 8pm once I got to Florence, so I decided to call it a night since I wasn’t able to see much during the dark hours. Since I was car camping, I pulled into a Fred Meyer’s parking lot for the night and this worked out perfectly. It had all the resources I need to be comfortable (bathroom and food) and the parking lot was pretty empty this late. The morning after, I hit the road and stopped at the Oregon Dunes Overlook just after sunrise. This was my first view of actual sand dunes, and it was so beautiful. I could see mountains of sand, tall grass fields, and the Pacific Ocean. There were a lot of hiking options here, but I decided to keep moving. The Natural Bridges are a formation of rocks that seem to form a bridge over the water. It’s a cool lookout point with a small trail that takes you to it. This was a super quick stop, but definitely worth it. After hours of driving on day two, I finally made it to the California boarder. At this point, the terrain started to get more and more dense with trees. It was obvious that I was starting to come up to something spectacular. My first stop in California was a trip to the Trees of Mystery. Its a park located in the Redwood National Forest that allows you to explore the area and all the magnificent trees within it. There’s a lot of museums, trails, and plants to explore, this was one of my favorite parts of the trip. A really fun activity we did was the Sky Train over the tress. I had a bird’s eye view of the forest and it was magical. The Trees of Mystery took up most of the day, so I continued on down Highway 101 until I hit Eureka, California. This is where I decided to call it a night. I ended up parking on the side of the road in front of an assisted living center to sleep through the night. In all honesty, this town wasn’t any spectacular (no offense to you locals out there). There was a large homeless population and I had an uneasy feeling in a lot of the areas. Nonetheless, I slept with no problems. With Eureka in my rear view mirror and a coffee in hand, I continued south for the last leg of my road trip. Day three is the day that I would finally hit San Francisco and complete the fun part of my road trip. About 50 miles further, I pulled over to see the Shrine Drive Thru Tree. I had to get a picture of my favorite car driving through a tree in my favorite forest. They also had a fallen log that I was able to drive my car onto. It was a fun playground for adults and their real life car toys. For this leg of the trip, I continued along the coast onto Highway 1. This leg follows the coast a lot closer when Highway 101 starts to go further inlet. It brought me to a really interesting beach called Glass Beach. 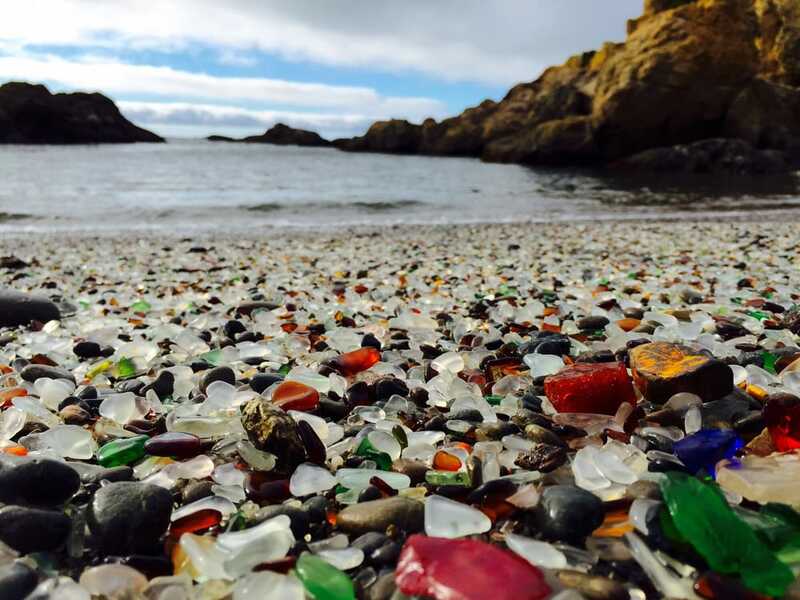 It’s located in Fort Bragg and shimmers with color from the glass pieces scattered around the beach. The glass in the beach is a result of a former land fill that was located in the same spot. Parts of the broken bottles still remain and make it a really unique place to visit. After almost 60 hours of travel time, we finally arrived to our destination city: San Francisco. With its stunning architecture, mild temperatures, and thriving LGBT culture, I was so excited for my visit to this city. Make sure to check out our blog post on visiting San Francisco! The drive down highway 101 was one of the most beautiful road trips I’ve ever taken. The west coast of the United States has some incredible landscapes that you just can’t find anywhere else. Contact us if you need help planning your next road trip!